When Mike and Kelly and I come together, we always wind up with an overabundance of bananas from both our households. Some travel all the way to Moscow from Portland, needing to be used up before they turn liquid. Others have accumulated at my home base, as I try to squirrel away more than usual for Mike’s morning smoothie habit. The result is usually a mountain of overripe bananas. The week they came to help me move was no exception to that rule. Mike walked through the kitchen on the way to something else, pondering the bananas along the way. “Someone needs to make a banana bread,” he said more to himself than anyone else. But I heard it. And it catapulted me into banana bread land, and a funny memory long ago when some overripe bananas were sitting on the very same kitchen table. Mike was maybe 11 or 12. I kept asking him if he would eat some banana bread if I made it (wanting to use up the bananas, but fearing I would eat it all myself if he didn’t want any), and like a typical preteen, he kept not answering me with anything definite. Finally, he said, “MOM! What IS it with the banana bread? !” I looked at the bananas, and looked at him, and said, with an absurd amount of misplaced passion,”The clock is TICKING on these bananas! !” Suddenly I saw both how ridiculous I sounded and could picture how ridiculous my hyper-focus on not wasting the bananas might have looked to him. We locked eyes and both started to laugh. And I made some banana bread. This time we were dismantling the house. And that, I rationalized, was good reason to use up bits and pieces of things in the fridge and in the cupboards. Could I pull together from such bits and pieces a banana bread that would delight all the hungry movers I would have on my hands in a few hours? I had sorghum flour. I had tapioca starch. I had a little maple syrup. And all those bananas. Even though there were a million other things to do, I couldn’t resist the challenge, and the chance to bake one more thing in my old kitchen before it wasn’t mine anymore. Most of the useful and effective techniques I learned for baking gluten free come from Karina’s fabulous blog Gluten-Free Goddess. And most of the ingenious strategies for making baked good fat free come from Fat Free Vegan Kitchen. In fact, I referred to Susan’s blueberry-banana bread recipe as I mocked up this version. It’s “kicked up,” as Karina would say–goodness I love that phrase (as if the banana bread itself had heels to kick up in the air! )–with a little bit of lime zest, some powdered ginger–and never fearing too much of a good thing–some dried banana bits. That’s what makes it “double” banana bread. So don’t leave them out if you can find some that are not made with oil or extra sugar. In fact, if you have a food dehydrator, you can make them yourself in just a few hours by cutting up part of a banana into small pieces. Line your tray with baking parchment first though, because they get really sticky as they dry. Mix the almond milk and the lemon juice together and let it sit for a few minutes to curdle. In a large bowl, mash the bananas thoroughly with a fork. Add the maple syrup, vanilla, and almond milk-lemon juice mixture to the bananas and mix well. In a medium bowl combine the sorghum flour, tapioca flour, baking powder and baking soda and mix together with a whisk or a fork. Add the banana bits and chopped dates to the wet mixture. Add the flour mixture and the walnuts and fold altogether gently until well combined. Spoon/pour into a silicone non-stick loaf pan. Or line a glass or metal pan with baking parchment and spoon/pour the batter into that. Bake for 50-60 minutes, depending on your oven. It’s done when there are a few cracks in the surface and a toothpick comes out clean. Let cool for a few minutes, then turn out onto a metal rack to continue cooling. Please wait until it’s completely cool to slice. 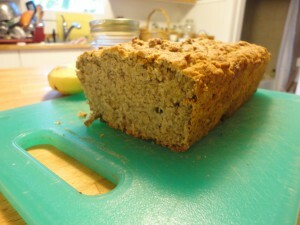 Gluten-free loaf breads will fall apart if you try to slice them when they are still very warm. Notes: Just as you should be careful to let it cool before slicing, also be careful not to over bake your bread. I baked the one I made at the new house just a tad too long, and that can contribute to it crumbling more easily. But it will still taste good. So as not to scarf it down all myself, I use Karina’s trick of slicing and then wrapping individual slices in aluminum foil. You can also stack them with some wax paper or baking parchment in between and put in a freezer bag. But I like the individually wrapped slices. I’m a little squeamish about using the aluminum foil alone, so I first wrap each slice in some waxed paper. A little extra work, but I worry less. And once it’s in the freezer, I forget about it. So every once in a while I see it’s there, and I can have a little treat. Usually when I’m baking gluten free, I like to make my own flour-starch mix as I learned to do on Karina’s blog. But this time I was using up what was on hand, so I didn’t combine the sorghum flour with any other flour. And I was happy with the results, because sorghum flour works well on its own, along with some starch, like the tapioca. Even potato starch will work well in baked goods. I so much enjoy all your stories along with your recipes. Would you please e-mail me privately. I recently met a man who has MS for 20 yrs now. I wanted to share something he told me with you. Looks like another great recipe! One of my favorites is your crust from Pumpkin Pie in the Free World. I live in Boise, and visit our sons in Moscow a few times each year. I love Moscow! I’ll do that Maria! I always stop by the Coop! Yum! I do love me a good banana bread. 🙂 I love your addition of the dried banana bits! I’ve got a bunch of overripe ones, but I have an alternate plan for them (writing it up for my blog! )… However, I’ll probably make some of this bread the next time! I often buy extra bananas just so I know some will go to the overripe state and I have an excuse to make tasty baked goods. Thanks, Veronica! You’re such a good chef, I’m pleased you like the addition of the dried banana bits. 🙂 Can’t wait to see what banana magic you’ve dreamed up yourself. 🙂 extra bananas are like money in the bank! Oh my goodness! I have all the ingredients to make this. Right. Now. Including, and wait for it, it’s fantastic… my very own maple syrup from our very own trees made by my very own Mr. Doodlepunk this spring! Welcome, Jules, and thanks for your question. 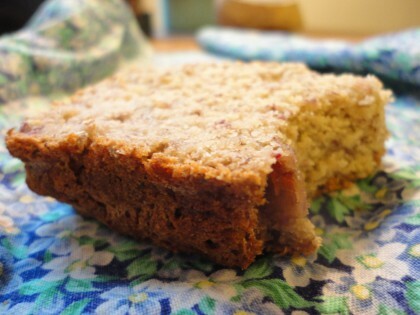 Since this recipe is a gluten free version based off of Susan’s Blueberry Banana bread, yes, you can just use two cups of wheat flour instead of the sorghum and tapioca flours. You would need to adjust the proportion of baking soda and baking powder back down to 3/4 tsp of each. In gluten free baking more baking powder is needed. Here’s the link to the recipe I improvised on, so you can double check proportions of flour and baking soda and powder. Made this today for breakfast. It’s really good, thanks! Made this recipe today and I’m kind of disappointed. I specifically bought the flours so that I wouldn’t have to substitute anything and followed the directions to the letter, leaving out the nuts and dates and it came out very dry. I was careful with the cooking time and cooled it on a wire rack. The flavor was good but we used way too much vegan margarine on it, trying to make up for the dryness. The flavor was great but they fell apart in our hands. I will tweak the wet ingredients next time and report back. Thanks for your feedback, Debi. Sorry to hear it came out dry for you. Bananas vary a great deal in how moist they are: the ones I used were very large and very very ripe. Perhaps increasing the maple syrup and almond milk to 1/2 cup would do the trick. Or to be on the safe side, you might want to add each of these liquids by the tablespoon full and see how the batter looks. Hi , I made this bread but it came out to be too crumbly. I added 1/3 rd cup of aquafaba too as the batter was too dry when i was mixing it and baked it for 45 minutes as it was done by that time. I roasted the bananas as mentioned in the comments . The taste is very good . Will try again perhaps bake it for lesser time. HI Rick, thanks for the feedback. It’s always a gamble with gluten-free baking–kind of depends on the gluey power of your particular bananas and tapioca starch. I’m thinking that roasting the banana may taste good, but it also may soften the bananas in terms of their egg-like qualities. I bet the aqua faba helped. If you’re not averse to a little fat, you could also try putting in a tablespoon of ground flax seeds. They soak up some of the liquid and act like an egg. Or you can make a “flax egg” with 1 tbs of ground seeds and about 3 tbs of water or aqua faba. I’m glad you liked the taste–and good luck adjusting ingredients and baking times to fit your particular situation and gluten free baking adventures!